. : Lunar Palace v.5 - Japanese: Sailor Chibi Chibi Moon :. 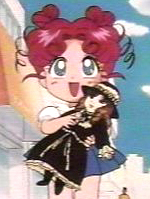 Chibi Chibi first appears in Sailor Moon Sailor Stars. Chibi Chibi doesn't talk, she says her name and repeats things that are said. She stays with Usagi and her family and poses as Usagi's sister. Just about everyone thought that she was either Usagi's daughter or Chibiusa's daughter. But as far as Pluto's concern the King and Queen only have one daughter. Now no one is sure who Chibi Chibi is because she resembles Usagi. Chibi Chibi is actually the Star Seed, of Sailor Galaxia. Also known as the "Light of Hope". Before Sailor Galaxia sealed Chaos within her, she told her Star Seed to fly away to the far reaches of the galaxy where Chaos can't find it. She told it to search for someone who will embrace it warmly, and it found Usagi.